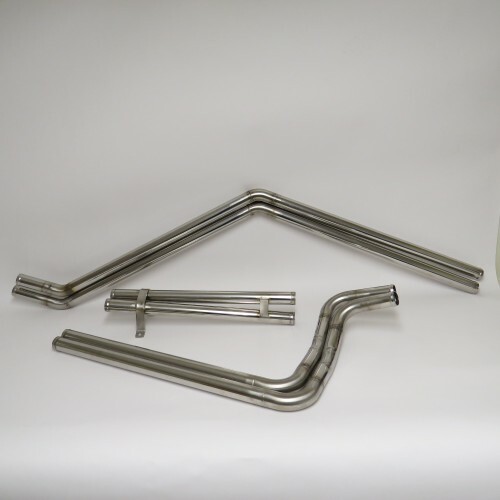 Complete set of stainless steel coolant pipes for Brazilian Kombi right and left hand drive. These are made from 302 stainless steel and made in the UK by Oakley Innovations (Lite-Steer) and are a direct replacement for the original. Each section is available separately. Pressure tested to 30lbs to ensure it’s leak free and guaranteed for 2 years.
" I have a 2008 water cooled Brazilian T2 Kombi, and have had EPAS fitted by Neil at Litesteer as well as some other work done and have found the service and quality of workmanship second to none. After having my van MOT'd with an advisory that there was some corrosion on the coolant pipes at the rear of the vehicle, I went on holiday to Cornwall for three weeks. On day two I noticed the pipes had now sprung a leak, once home after the holiday I contacted the people I bought the van new from who import them to obtain new pipes, to no avail. I tried everywhere to source new pipes but had no luck. In desperation I phoned Neil for advice, straight away he said he could fabricate some from stainless steel it would not be a problem. Sure enough gave him the van, and a short while later it was done, shiny new stainless pipes front to back and had even cured the gurgling sound I had from the radiator since new! These guys are fantastic, nothing is too much trouble and the attention to detail brilliant, Neil is, in my opinion not just an engineer but a craftsman.